Scope mounts for AR 15 rifles are one of the most overlooked pieces of gear. Getting a bad unit can lead to several aggravating range sessions trying to diagnose why a rifle isn’t shooting accurately or has a wandering zero. 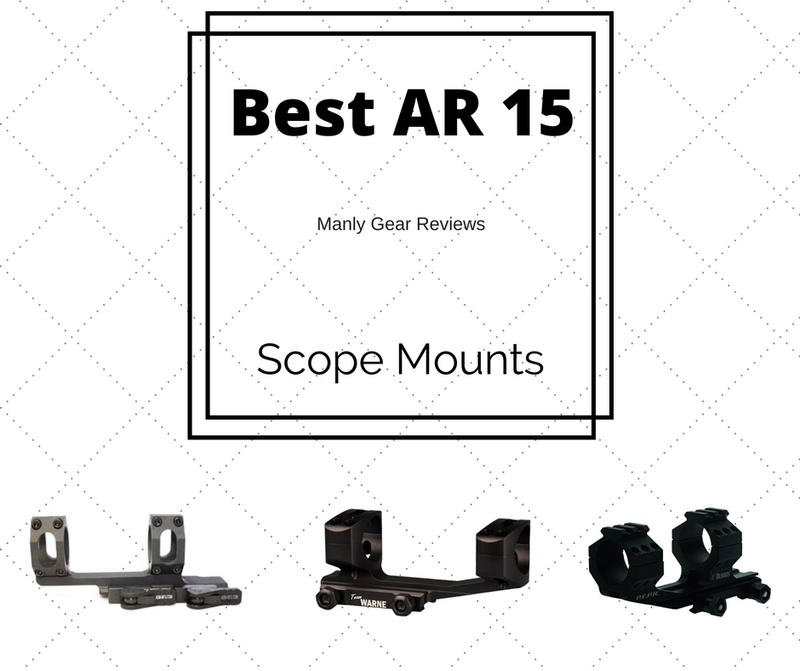 Here is a list of the best AR 15 scope mounts for every budget. The scenario is all too common. An excited owner of a freshly built or bought AR 15 finally got the rifle of their dreams and wants to shoot it asap. Their wallet is still feeling the sting from buying a quality firearm so they start shopping for budget scopes and mounts. They find that $15-$50 mount and rush out to the range. Maybe it works for a range day or two but sooner rather than later that cheap mount is going to fail you. Whether its from accidentally over-torquing the screws just a bit or while sitting in your truck’s backseat going over a washboard road. Cheap mounts generally always come back to bite so its worth getting a solid one right out of the gate. Durability: Normally the number one thing you are paying for when you jump up from that bottom of the barrel mount group is durability. The best AR 15 scope mounts will hold zero when under extreme recoil and when an optic gets bumped or hit. A scope mount’s only job is to hold your scope to your rifle with extreme consistency. If it can’t do that, it’s not better than a paper weight. Value: To get the most value out of your AR 15 scope mount you need to be realistic with what your needs are. If you are traveling to and from the range and your rifle goes from your safe to it’s case you may be completely fine with some of the sub $100 mounts on this list. If this rifle rides in your truck every day, gets used for hunting or shooting multiple days a month it may make sense to go a little higher end. Features: There’s really only a couple features a scope mount can have. We’ve already covered one, and that is to reliably hold our scope. Another feature some may consider important is having QD (quick release) levers. This enables a user to mount and dismount optics with no tools. Some may also find the need to side or top mount a red dot sight which a couple of these mounts will accommodate. I purchased my first Bobro Precision Extended Mount several years ago and it has been my goto high end ar 15 scope mount ever since. The one piece design helps in keeping the mount uniform and extremely strong. 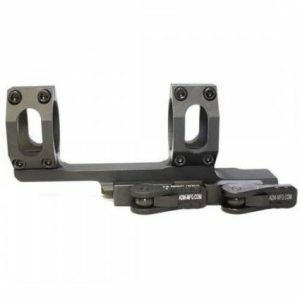 The anodizing is the best of any mount on this list. All that is well and good but non of that makes this the best mount you can buy. What makes the Bobro king of the hill in AR 15 scope mounts is how it clamps to your rifle. The Bobro utilizes a pretensioned lever that evenly distributes clamping force. The clamping force is so even and repeatable that you can zero your rifle, remove the optic, then place it back on while retaining your original zero. The other top 5 mounts in this list can come close to doing that but non are as close to perfect as the Bobro. The Burris AR-PERP Mount has been a staple of the budget AR 15 scope mount for years. Don’t let its country of origin fool you (China), this mount is definitely a step above the many other mass produced mounts to come out of there. With 6 screws per ring, the Burris keeps a strong even grip on your scope. 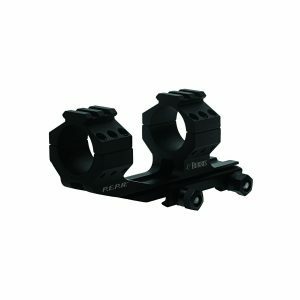 Similar to Nightforce rings, the Burris uses 1/2″ hex nuts to secure this mount to your picatinny rail at a high torque value to ensure no slippage. Although many will probably not use them, at the top of each ring there is a small 3 row picatinny strip to be used with a red dot or other auxiliary item. 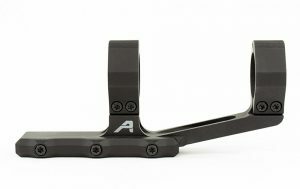 Coming in under 3.4oz, the Aero Precision Ultralight AR 15 Mount is the lightest mount on this list. This is part of the reason as to why I run this mount on one of my personal AR 15’s. Besides its ultralight weight, the Aero mount also has a ring design that is very unique. While each ring has 2 torx screws at the bottom, the top of the ring has a hinge mechanism that keeps the torque on your scope’s tube evenly distributed. To keep the weight as minimal as possible, the Aero mount does not offer a quick release but instead features a single clamp bar that is about 3″ long. The clamp bar is tightened by 3 torx screws. This mount has survived 2 coyote hunting seasons on top of one of my AR 15’s. This includes lots of in and out of vehicles along with the occasional fall. This mount has proven to be extremely reliable. Warne has been around for quite a while mostly offering solid rings and scope bases for hunting rifles. 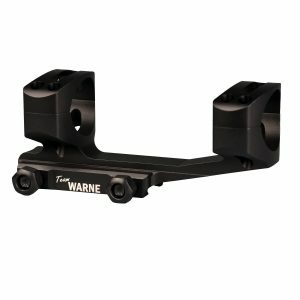 This new Warne scope AR mount has been making a splash on the 3 gun scene as a great sub $100 mount. Taking many design notes from the Burris, the Warne mounts to your AR 15 with 2 solid 1/2″ bolts. Despite similar looks, the Warne has a much more premium look and feel. If you need a solid mount and are willing to spend upwards of $100, you will not be disappointed in the Warne Skeletonized AR Mount. The American Defense Recon Mount is one of the most affordable 100% USA made quick detach mounts. When going with a quick detach mount the need for getting one that is quality is that much more important. 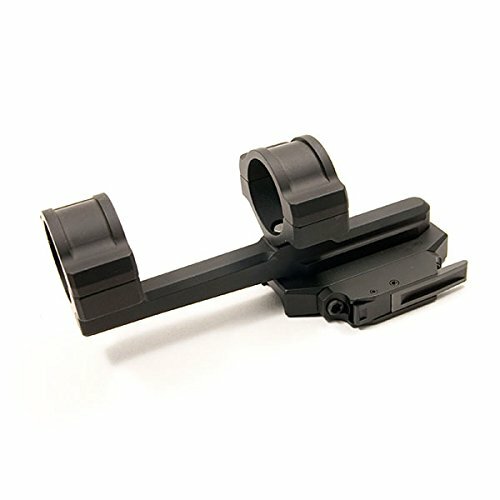 With the additional moving parts involved in a quick detach mount, the American Defense method of implementing it gives the user confidence. The tension on each lever is easily adjusted from the back side so the mount has a consistently strong grip. The ring design is also unique to ADM. With 4 screws total (2 top, 2 bottom) it’s easy to make sure torque is implemented evenly top and bottom. One thing to keep in mind with this ring design, the initial mounting of your scope can be a bit more difficult than you are used to. With split ring designs, you have to hold your rifle sideways until all screws are in, but not torqued. Then you can place your rifle upright and torque the screws once you have your reticle strait. Definitely not a reason to pass on a mount but just something to be aware of. Putting this mount on all my rifles!